A young Vietnamese banker who has suffered a stroke (CVA) works to regain functional use of his hand and arm under the care of American and Vietnamese therapists at the new out-patient facility of the Traditional Medicine Hospital of Da Nang, located at 342 Phan Chau Trinh Street. In addition to neuro-rehab and treatment of chronic and acute pain, this facility also provides effective and affordable treatment of heroin addiction via acupuncture and other traditional remedies. A motorbike taxi driver rejoices in regaining both the use of his right arm and his ability to balance on a two-wheeled vehicle with the help of Thuy, an American-trained Vietnamese physiotherapist. 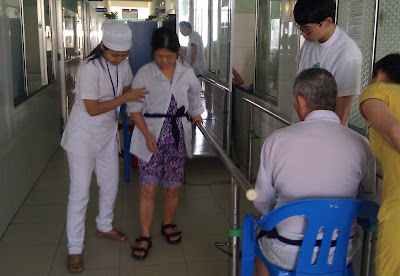 More info on physical therapy in Vietnam here. Tea shop at the new out-patient facility of the Traditional Medicine Hopsital of Da Nang, located at 342 Phan Chau Trinh Street features the art work of disabled artist Nguyen Tan Hien.